Nearly 100 years after Jagadguru Bodhendra Saraswathi Swamigal and Sri Sreedhara Venkatesa Ayyaval attained the Lord’s feet, Sri Venkatarama Sadhguru Swamigal incarnated. The path established by Maha Purushas is never forgotten. Nama Keerthan, the essence of the Bhagavatha Dharma is still flowering from vedic age till today. Now and then from Narada onwards down to Sadhguru Swamigal, great men are appearing in this world. If the Lord had not sent these great souls and protected it, the Bhagawatha Dharma would have been altogether forgotten. Nama Keerthana, the essence of Bhagavatha Dharma is propagated by Greatmen. Due to the adverse effect of Kaliyuga, people lose faith now and then in Nama Keerthana and other dharmas. At such times, great men incarnate on earth and preach Nama Keerthana. The conclusion arrived at by all scriptures is that no useful purpose will be served by any means (sadhanas) other than Nama Keerthana. This was established by Bhagawanama Bodhendra Swamigal. He preached this, travelling from village to village. Many families received upadesam (initiation) from Swamigal and were doing Nama Keerthana. In course of time people doing Nama Keerthanam gradually decreased, because during the next hundred years after Bhodendral’s siddhi no great soul equal to him was born. The works of Bodhendra Swamigal and Sridhara Ayyaval relating to Nama Sidhantha were lost due to negligence. Only a few are available now. These works, which were given to the world by these two out of their infinite grace without expecting any reward, were not preserved by posterity due to people’s carelessness. Some of these were not appreciated by those who were proud of their learning but were saved by certain families owing allegiance to Bhagavatha Dharma and those who were doing Nama Sankeerthana. People’s interest in doing Nama Keerthana gradually decreased and very few families were doing it. Vaidhikas looked down upon those doing Nama Keerthana, decrying that it was against Vedic practices. In this state of things, Bhagavathas finding no refuge were unable to speak out their Siddhantha. It was at this time, that Sadhguru Swamigal incarnated. An Andhra Brahmin by name Venkata Subramnaya Iyer was living in the village Thiruvisalur of Tanjore district. He was well versed in Vedas, led his life according to vedic discipline and was following the Bhagavatha Sampradhaya. Since he was very poor, he engaged in Purohitham (guiding religious rites) for his livelihood. By God’s grace, Sadhguru Swamigal was born as his son for propagating Bhagavatha Dharma for the welfare of the world. In their family, due to devotion to their kula daivam (family deity), it was customary to add Venkata to their name. Hence, though he was named as “Raman” he came to be known as “Venkataraman”. The child hood deeds of Sadhguru Swamigal were extraordinary. These are leelas of divine children like those of Sadhguru. Upto its third year, the child did not speak any word and was dumb. Parents became sad due to this. During this time, a great soul came to that place. Hearing about this child, he saw him and did not understand anything for a moment and thought within himself, “ah is this child dumb?. I see God’s power in this child. That Sakthi’s form is the cause of the dumbness of the child. Formerly, some like Jada Bharathar used to be like this. The author of Divya Prabandas – Nammalwar was like this and lived under a tamarind tree. Kumara Gurupara Swamigal of Srivaikuntam was also dumb like this for six years. Their life history reveals this. This is no wonder. It is certain that the child is not dumb. Soon, he will become a Mahatma and will be praised by all. Saying this, he went away. Father became hopeful. As in these times, there was nobody then to medically treat dumb people. He was finding a way out by invoking the grace of Lords devotees. A fit occasion also came. There was a village nearby named Mananchery, where the river Veerachozhan gets separated from Cauvery. There lived a great devotee of the Lord by name Gopala Bhagavathar. His only occupation was to constantly utter Raama Naama. Very simple as he was, even the people in his own village did not know him. How could the world know him? The child’s father happened to hear about him and told him of his problem. Bhagavathar told him, “I have only one remedy. That supreme medicine will cure all diseases. It is certain to cure your child’s dumbness”. Calling the child to his side, he uttered the Tharaka Mantra “Raama” in his ear. As though suffering from an electric shock, the child at once fell down unconscious. After some time he woke up and began to utter “Raama Naama” loudly. Sastrigal was rid of the great worry about his son. Can anybody control him hereafter? He was immersed in the ocean of bliss. The child became seven years old. He prepared for the Upanayanam ceremony of his son. He gave utmost importance to mantras and religious rites only. He did not make a show of it. He had no money also for that. Without any obstacle, Upanayanam was done at the appointed hour. When Brahma Upadesam was done, our Sadhguru Swamigal saw in his heart the omnipresent Sri Rama and was immersed in great bliss. When the ceremony was over, Rama also disappeared. He wept, loudly when he did not see the form of Tharaka Murti “Rama” in his heart. All were worried saying, what is this? “The child’s crying like this looks inauspicious”. Sadhguru Swamigal told his father, “Dear father, when you imparted the manthra I saw Rama, my God within me. As you finished, he also disappeared. Where will I search for him, now?” saying this, his heart melted. The father of present days would have punished the child thinking that he had become mad. As Sastrigal was rich in Gnana, he danced in ecstasy at that time. He uttered loudly “Hey Rama, Hey Sadhguru, protect me” from that day, the child was called “Sadhguru” by all. He saw everything as Rama. Then came an appropriate time to learn Vedas. If one wants to learn anything, he must necessarily go to a dispelling ignorance and imparting Gnanam. If the ancient systems of learning in a Gurukula were in vogue today, will not everyone become a Sadhguru Swamigal? Our Sadhguru Swamigal had his own father as Guru and was learning his lessons from him. Father also was aware of the greatness of his son and instructed him in Veda and Shastra lessons with great interest. Once he was learning the kavya ‘bhoja champu’. When reading Ayodhya Kanda therein, there came a verse, uttered by Kausalya to Rama, when Rama took of her leave before going to forest in which it is stated. “Hey Raghava, would not Vasishta have known that the ensuring coronation would be stopped? Perhaps he would have tied the Raksha (sacred thread) in your hand, which is marked by Sankha Chakra, Lotus and yields welfare to all the world, with the intention that you should go to the forest, pluck fruits and plants therein and eat them”. Thus father was teaching this verse uttered by Kausalya in a moving way. The Son forgot himself and the memory of his previous descent as Rama came to his mind and he wept loudly and swooned. Father did not understand the reason for this. He thought his son was unwell and stopped the lesson. At another time, he was teaching Aranya Kandam in the Champu Ramayana. When the incident describing the abduction of Sita was narrated, Sadhguru Swamigal himself became Rama in his Bhava, got angry and cried, “lakshmana, bring my bow at once, I will kill Ravana now from here itself.” “The father seeing the son’s Swanubhava, became thrilled, forgot himself and prayed to his son, like Prahlada to Lord Narasimha, “kindly restrain yourself”. Swamigal then came to normalcy. Father felt that he was incapable of teaching his son any more as he knew already all Sastras and stopped teaching further. Whenever Sadhguru Swamigal heard about the anguish experienced by Dasaratha, Bharatha, Sita and others in the Ramayana, he wept and swooned. From his boyhood, his mother used to narrate Ramayana to him, hearing which he lost himself. Once Sri Venkata Subramanya Iyer was performing pooja in their house. Seetha, Lakshmana, Rama and Anjaneya idols, which were being worshipped by their ancestors, were kept in their pooja. Then, Sri Venkataraman with folded hands was sitting nearby and steadily looking at the face of Rama. After the pooja was over he did not come out inspite of his parent’s call to do so. Then ultimately when he was forced to come out, he said, “alas, is this not the same Rama who went to the forest? Mother, is this not the same Seetha, who was carried away by Ravana? Is this not the same Lakshmana who fell down unconscious in the battle filed?” and thus saying he began to weep looking at the idols, realizing that the same gods themselves have now come in this form. Parents wondered at the boy’s devotion to God. Sometimes, mother used to tell him incidents relating to the lives of Bodendra Swamigal and Sridhara Ayyaval. He listened to them carefully. Keeping these in his mind, he narrated the same to his playmates. Thus, even in his early childhood, he acquired devotion to the Lord and knowledge of sastras. 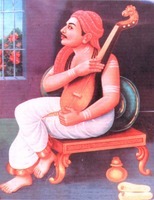 He learnt music also from a Sangeetha Vidwan. As it has been established that the essence of all sasthras is only the divine name, he obtained initiation and Nama Sutra from Gopala Bhagavathar himself and like Bhodendra Swamigal chanted daily one lakh and eight thousand divine namas. Often, as ordered by his father, he used to go to other villages and also do purohit (instruct people there to perform their religious rites). One morning he went to a village named Mananjeri where a householder had invited him to conduct the annual ceremony. On the way there was a Ganesha temple in the village Karupur. He sat there and began to do Nama Sankeerthana. If Sri Venkataraman sat to do Nama Sankeerthanam, he used to get immersed in Bhagawan Nama Nishtai, forgetting the world. When he woke up from Samadhi, it was evening. He felt grieved that the annual ceremony could not be conducted by him that day. He cursed himself for his failure to comply with his father’s command to him. Not knowing what to do, he returned home. Sri Venktata Subha Iyer, who had gone out for fulfilling an engagement, returned home. When he learnt that his son could not conduct the ceremony, felt very angry, but without admonishing his son, he went to that house holder to know how he conducted the ceremony. On the way, he met that householder who came after performing the ceremony and apologized to him with anguish and shame for his son’s failure to conduct the ceremony that day in his house and asked him how he managed to perform the ceremony. The householder replied, “your son came and conducted it in a far better manner than yourself”. On hearing this he was wonder struck and without speaking further to the householder returned home and enquired Venkataraman. He replied that he was not uttering a lie. His father exclaimed. “I know you will not lie”. The householder will not also utter falsehood. What wonder is this? On hearing this Venkataraman was moved, by devotion and shedding tears from his eyes, he wept saying “alas, Janaki Ramana, Dasratha Nandana, the refuge of all who adhere to Sathya steadfastly, it was you who went to conduct a ceremony for fulfilling the father’s command, totally forgetting your high status. Due to my sin, you had to suffer like this and swooned. Venkata Subbaiyar shed tears of joy knowing how staunch his son’s bhakthi was and understood that the event could have happened. Like Sri Raghava’s marriage at the age of sixteen, Venkata Subbaiyer got his son married to Janaki, a girl from a good family. Like Janaki herself, this Janaki possessed special qualities. As Sri Ramachandra felt happy with Seetha, in the same manner, Sadhguru Swamigal made her happy, far beyond her expectation. Thus, Sadhguru Swamigal entered Grahasthashrama and with his wife served his parents well. He performed pooja to his family treasure, the idol of Sri Rama and was doing nama Kirthana as usual. With the meager income from his ancestral profession of a pandit, he led a simple happy life. The purpose of this avatara was to show how to observe Bhagavatha Dharma by setting an example himself. His family life went on in that way only. In course of time, Venkata Subbaiyer attained Lord’s feet. After that, Sadhguru Swamigal had to bear himself the entire family burden. But Swamigal who was capable of protecting the entire world did not entertain any fear or worry in this regard.